I’ll begin by stating we are not experts on pocket watches so all the information contained here is from research. Please view the pictures as they form a major part of the description. 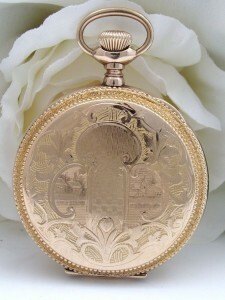 This is another Stunning Antique Pocket Watch that dates to 1904 making it 106 years old, just amazing! The pictures do not do it justice at all. It is in excellent working order and has been fully serviced by a Specialist and comes with the remainder of the warranty for that service. It comes complete with the original fitted jeweller’s presentation case stating its origin to be W. H. Beck Company, Sioux City, USA. The actual watch is elegantly decorated with black & red enamel numbers and Blue Steel hands for all three hands, including the second hand. The dust cover is engraved FMF from KFF Xmas ’06 for 1906. The case is a Hunter Case with each cover tooled with a similar design – the only difference being the cartouche on the front cover has the initial F. The gold’s hue is a warm yellow with a hint of Rose typical of the era. Case: trademark – Keystone. Maker has a long history of succession however the company known as the Keystone Watch Case Company was organised between 1883 and 1885. Material: Gold Filled – unmarked but testing and research confirms this is how it was constructed and that they were known to come with a warranty of 20-25 years. Near MINT Antique condition! There are some subtle, insignificant signs of use that are minimal. There are no dents, no damage, minimal wear to the interior and no repairs evident. There is a slight craze line to the face. There is absolutely nothing that detracts from this lovely old piece and it would make addition to a collection of Victorian antique pocket watches.